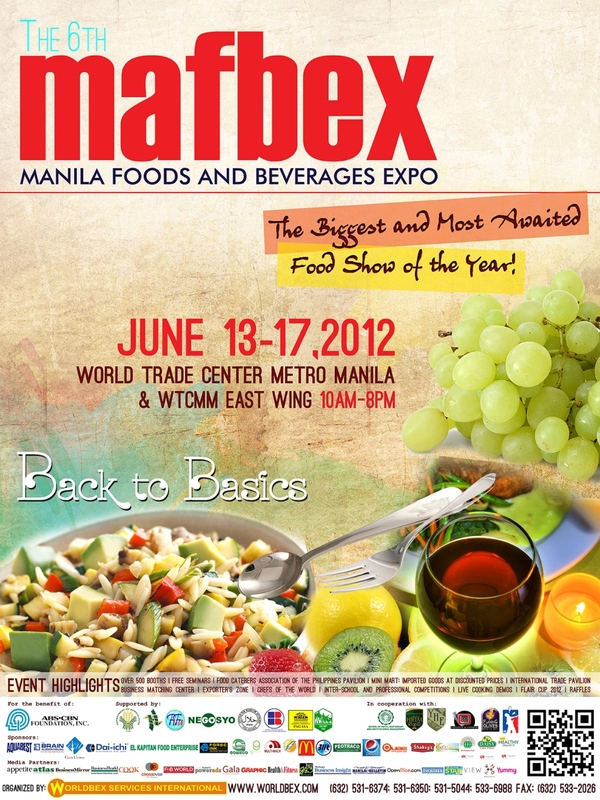 It's the 6th year of the biggest and most awaited food event of the year, the Manila Foods and Beverages Expo (MAFBEX). Headlining with its theme "Back to Basics" this year, the grand expo is happening at the World Trade Center, extending to the East Wing on June 13 to 17, 2012 from 10am-8pm. This 2012, MAFBEX has decided to go back to basics, as the rise of health-conscious Filipinos have grown tremendously over the years. Putting the spotlight on organic foods, this expo aims to provide tips and tricks to widen the knowledge of people to live a healthier lifestyle. Entrance to the event is Php100, but Glich's Life is hooking 30 people with free tickets and MAFBEX shirts. Simply join the giveaway below, which will run from June 4 to June 11, 2012. Please join if you will be able to attend in any of the event dates only, so we won't waste the slot. Winners will be announced on June 12, 2012 here. Thank you to everyone who joined the giveaway! Announcing the 15 lucky winners! The first five in the list will not only get 2 tickets each to enter for free, but also 1 MAFBEX shirt each. The rest will still get 2 tickets each. You will receive an email from me within the day on how to claim your prizes. Once again, congratulations! I'm Excited and looking forward to this event! You're welcome. Enjoy and congratulations! I emailed reply regarding the winning, hoping I can have my friend attend in my behalf because I wont be able to make it due to work. Hi! I didn't receive the email. But please let him/her bring a copy of your ID and authorization letter that he/she will be attending on your behalf. Thanks!